A former Highland Games athlete believes he can identify the remains of a musical instrument found buried on Ben Nevis. 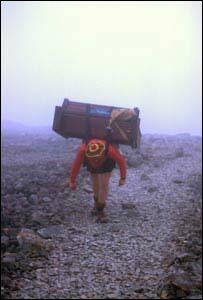 Kenny Campbell said he carried a 226lb organ to the top of Britain's highest mountain in 1971 after an aborted attempt to carry a piano on his back. 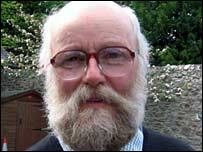 The 64-year-old, from Ardgay, said he left the organ on the peak with the intention of going back for it. However, other theories about the instrument's origins have emerged. The saga began when volunteers discovered the large keyboard instrument buried under a stone cairn. Mr Campbell, who undertook his challenge for charity, said he returned to Ben Nevis with the full intention of carrying the organ back down. He said: "I went back two months later to take it back down and there were only two small bits of wood left. "I searched all about the summit but that's all I could find. Someone must have built it into a cairn to save me having to take it back down." The former Highland Games athlete has performed a number of stunts carrying heavy objects to the top of Ben Nevis. First, he tried the feat using a piano and managed to reach 1,000ft before he toppled over and it smashed. Next, Mr Campbell lifted a 250lb organ to 1,300ft but tore a muscle in an arm and had to give up. Feeling fully recovered from the injury six weeks later, he made a third - and this time successful - attempt. He said: "I carried an organ weighing 226lb to the summit and played Scotland the Brave on it and I had some Norwegian tourists who were up on the summit and they were dancing." Former Radio 2 producer Paul Newman recalled how he and his family came upon a man carrying a keyboard up the mountain on behalf of a cancer charity in 1971. Alongside Mr Campbell's exploits, a group of workers from Alexander Removals in Dundee claimed they carried a piano to the summit as a drunken prank 20 years ago. Local people have also spoken about a spate of bizarre stunts in the past with a variety of objects carried to the summit, often for good causes. Conservation volunteers from the John Muir Trust found the instrument during a clean-up operation earlier this week. They suspect the instrument was an upright piano. It was dug up from under a cairn during an operation by trust volunteers to reduce 100 cairns on the summit to 25. The instrument has been broken up to make it easier to carry off.